Saturday Night Fever is the soundtrack album from the 1977 film Saturday Night Fever starring John Travolta. It remains the second best-selling soundtrack of all time with over 45 million units sold, behind The Bodyguard. In the United States, the album was certified 16× Platinum for shipments of at least 16 million units. The album stayed atop the album charts for 24 straight weeks from January to July 1978 and stayed on Billboard's album charts for 120 weeks until March 1980. In the UK, the album spent 18 consecutive weeks at No. 1. The album epitomized the disco phenomenon on both sides of the Atlantic and was an international sensation. The album has been added to the National Recording Registry in the Library of Congress for being culturally significant. According to the DVD commentary for Saturday Night Fever, the producers intended to use the song "Lowdown" by Boz Scaggs in the rehearsal scene between Tony and Annette in the dance studio, and choreographed their dance moves to the song. However, representatives for Scaggs's label, Columbia Records, refused to grant legal clearance for it, as they wanted to pursue another disco movie project, which never materialized. Composer David Shire, who scored the film, had to in turn write a song to match the dance steps demonstrated in the scene and eliminate the need for future legal hassles. However, this track does not appear on the movie's soundtrack. The Bee Gees's involvement in the film did not begin until post-production. As John Travolta asserted, "The Bee Gees weren't even involved in the movie in the beginning ... I was dancing to Stevie Wonder and Boz Scaggs." Producer Robert Stigwood commissioned the Bee Gees to create the songs for the film. We were recording our new album in the north of France. And we'd written about and recorded about four or five songs for the new album when Stigwood rang from LA and said, 'We're putting together this little film, low budget, called Tribal Rites of a Saturday Night. Would you have any songs on hand? ', and we said, 'Look, we can't, we haven't any time to sit down and write for a film'. We didn't know what it was about. The brothers wrote the songs "virtually in a single weekend" at Château d'Hérouville studio in France. The first song they recorded was "If I Can't Have You", but their version was not used on the film. Maurice Gibb recalled, "We played him demo tracks of 'If I Can't Have You', 'Night Fever' and 'More Than a Woman'. He asked if we could write it more discoey." The Brothers Gibb then wrote a song called "Saturday Night" but as Maurice explains, "There were so many songs called 'Saturday Night' even one by the Bay City Rollers, so when we rewrote it for the movie, we called it 'Stayin' Alive'. Recording "Stayin' Alive" was not simple. [vague] Engineer Karl Richardson copied a choice few seconds of drumming from "Night Fever", cut out the piece of tape and glued the ends together, then fed it back into a recorder by a makeshift arrangement to create a new drum track. Drummer Dennis Bryon did not attend the recording of "Stayin' Alive". The original issue of the album included the original studio version of "Jive Talkin'"; later LP pressings included a version culled from Here at Last ... Bee Gees ... Live. All CD releases have included the original "Jive Talkin'". "Jive Talkin'" was to have been used in a deleted scene taking place the day after Tony Manero's first Saturday night at the disco, but as the sequence was cut for the final film, the song was cut as well. In addition to the Bee Gees songs, additional incidental music was composed and adapted by David Shire. Three of Shire's cues – "Manhattan Skyline", "Night on Disco Mountain" (based on the classical piece "Night on Bald Mountain") and "Salsation" – are included on the soundtrack album as well. Five additional cues – "Tony and Stephanie", "Near the Verrazano Bridge" (both adapted from the Bee Gees' song "How Deep Is Your Love"), "Barracuda Hangout", "Death on the Bridge" and "All Night Train" – while heard in the film, remain unreleased on CD. In 1994, the soundtrack was re-released on CD through Polydor Records. In 2006, the album was re-released on Reprise Records as part of the Bee Gees' regaining control of their master tapes. To commemorate the movie's 40th anniversary, Capitol Records released a newly remastered version on April 21, 2017 with the original artwork and gatefold packaging. On 17 November 2017, a deluxe box set was released with the original soundtrack, 4 new mixes of "Stayin' Alive", "Night Fever", "How Deep Is Your Love" and "You Should Be Dancing", a collector's book, art prints, a movie poster and a turntable mat. Along with the success of the movie, the soundtrack, composed and performed primarily by the Bee Gees, is the best-selling soundtrack album of all time. Saturday Night Fever had a large cultural impact in the United States. The Bee Gees had originally written and recorded five of the songs used in the film – "Stayin' Alive", "Night Fever", "How Deep Is Your Love", "More Than a Woman" (performed in the film in two different versions – one version by Tavares, and another by the Bee Gees) and "If I Can't Have You" (performed in the movie by Yvonne Elliman) as part of a regular album. They had no idea at the time they would be making a soundtrack and said that they basically lost an album in the process. Two previously released Bee Gees songs – "Jive Talkin'" and "You Should Be Dancing" – are also included on the soundtrack. Other previously released songs from the disco era round out the music in the movie. The soundtrack also won a Grammy Award for Album of the Year. It is the only disco album to do so, and one of only three soundtrack albums so honored. In 2012, the album was ranked No. 132 on Rolling Stone magazine's list of "The 500 Greatest Albums of All Time". The soundtrack hit the No. 1 spot on the Billboard chart's Pop Album and Soul Album charts. In 2003 the TV network VH1 named it the 57th greatest album of all time, and it was ranked 80th in a 2005 survey held by British television's Channel 4 to determine the 100 greatest albums of all time. Pitchfork Media listed Saturday Night Fever as the 34th best album of the 1970s. The album was added to the National Recording Registry in the Library of Congress on March 21, 2013 for long-term preservation. ^ "Gold & Platinum – November 30, 2009". RIAA. Archived from the original on August 20, 2010. Retrieved November 30, 2009. ^ James Sullivan; Chronicle Pop Culture Critic (January 14, 2003). "APPRECIATION / Contributor to a sound that went beyond disco". San Francisco Chronicle. Retrieved November 30, 2009. ^ Richards, Chris. "Library of Congress adds 'Saturday Night Fever,' Simon and Garfunkel, Pink Floyd to audio archive - San Jose Mercury News". Mercurynews.com. Retrieved April 7, 2014. ^ a b c Sam Kashner, "Fever Pitch", Movies Rock (Supplement to The New Yorker), Fall 2007, unnumbered page. ^ Rose, Frank (July 14, 1977). "How Can You Mend a Broken Group? The Bee Gees Did It With Disco". Rolling Stone. Retrieved February 18, 2015. ^ a b Melinda Bilyeu; Hector Cook; Andrew Môn Hughes. The Bee Gees. Retrieved February 16, 2015. ^ Various Artists: Saturday Night Fever | Album Reviews. Pitchfork (July 13, 2007). ^ "GRAMMY.com". GRAMMY.com. February 8, 2009. Archived from the original on February 15, 2009. Retrieved November 30, 2009. ^ "1977 Grammy Award Winners". Grammy.com. Retrieved February 14, 2015. ^ a b c d "In the groove: Grammys go disco". The Milwaukee Sentinel. February 16, 1979. Retrieved May 1, 2011. ^ "austriancharts.at Soundtrack - Saturday Night Fever" (ASP). Hung Medien (in German). Retrieved March 1, 2013. ^ "dutchcharts.nl Soundtrack - Saturday Night Fever" (ASP). Hung Medien (in Dutch). MegaCharts. Retrieved March 1, 2013. ^ "InfoDisc : Tous les Albums classés par Artiste > Choisir Un Artiste Dans la Liste : Bee Gees". infodisc.fr. Archived from the original on November 7, 2011. Retrieved March 1, 2013. ^ a b "Hit Parade Italia - Gli album più venduti del 1978" (in Italian). hitparadeitalia.it. Retrieved March 1, 2013. ^ "charts.org.nz Soundtrack - Saturday Night Fever" (ASP). Hung Medien. Recording Industry Association of New Zealand. Retrieved March 1, 2013. 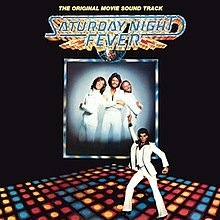 ^ "norwegiancharts.com Soundtrack - Saturday Night Fever" (ASP). Hung Medien. VG-lista. Retrieved March 1, 2013. ^ "swedishcharts.com Soundtrack - Saturday Night Fever" (ASP). Retrieved March 1, 2013. ^ "Number 1 Albums – 1970s". The Official Charts Company. Archived from the original on February 9, 2008. Retrieved June 24, 2011. ^ "allmusic ((( Saturday Night Fever > Charts & Awards > Billboard Albums )))". allmusic.com. Retrieved March 1, 2013. ^ "Album Search: Soundtrack - Saturday Night Fever" (in German). Media Control. Retrieved March 1, 2013. ^ "Austriancharts.st - Jahreshitparade 1978" (in German). Hung Medien. Retrieved March 1, 2013. ^ "RPM Top 100 Albums of 1978". RPM. Archived from the original on June 19, 2013. Retrieved March 1, 2013. ^ "Dutch charts jaaroverzichten 1978". Dutchcharts.nl. Retrieved March 1, 2014. ^ "Les Albums (CD) de 1978 par InfoDisc" (in French). infodisc.fr. Archived from the original (PHP) on July 11, 2013. Retrieved March 1, 2013. ^ "Japanese Year-End Albums Chart 1978" [1978年アルバム年間ヒットチャート] (in Japanese). Oricon. Retrieved March 1, 2013. ^ a b "1970s Albums Chart Archive". everyhit.com. The Official Charts Company. Archived from the original on October 6, 2009. Retrieved March 8, 2013. ^ "Top Pop Albums of 1978". billboard.biz. Retrieved March 1, 2011. ^ "Album – Jahrescharts: 1978". charts.de. Media Control Charts. Retrieved March 1, 2013. ^ Billboard.com – Year End Charts – Year-end Albums – The Billboard 200. Retrieved March 1, 2013. ^ "Canadian album certifications – Various Artists – Saturday Night Fever". Music Canada. ^ "French album certifications – Bee Gees – Saturday Night Fever" (in French). InfoDisc. Select BEE GEES and click OK.
^ "Gold-/Platin-Datenbank (Bee Gees; 'Saturday Night Fever')" (in German). Bundesverband Musikindustrie. ^ "Gold Disc Award 1979". IFPI. Archived from the original on March 18, 2012. Retrieved August 17, 2012. ^ "Italian album certifications – Artisti Vari – Saturday Night Fever" (in Italian). Federazione Industria Musicale Italiana. Select "2016" in the "Anno" drop-down menu. Select "Saturday Night Fever" in the "Filtra" field. Select "Album e Compilation" under "Sezione". ^ Murells, Joseph (February 5, 2016). Million selling records from the 1900s to the 1980s: an illustrated directory. Batsford. Retrieved April 30, 2013. ^ "British album certifications – Original Soundtrack – Saturday Night Fever – OST". British Phonographic Industry. Select albums in the Format field. Select Platinum in the Certification field. Type Saturday Night Fever – OST in the "Search BPI Awards" field and then press Enter. ^ "American album certifications – Bee Gees – Saturday Night Fever". Recording Industry Association of America. If necessary, click Advanced, then click Format, then select Album, then click SEARCH. This page was last edited on 14 March 2019, at 17:52 (UTC).